Charming map of New York City before consolidation - labels individual residences throughout Brooklyn, Queens, and New Jersey. Sidney's Map of Twelve Miles Around New York. This is an 1849 James Charles Sidney map of New York City and the surrounding area. 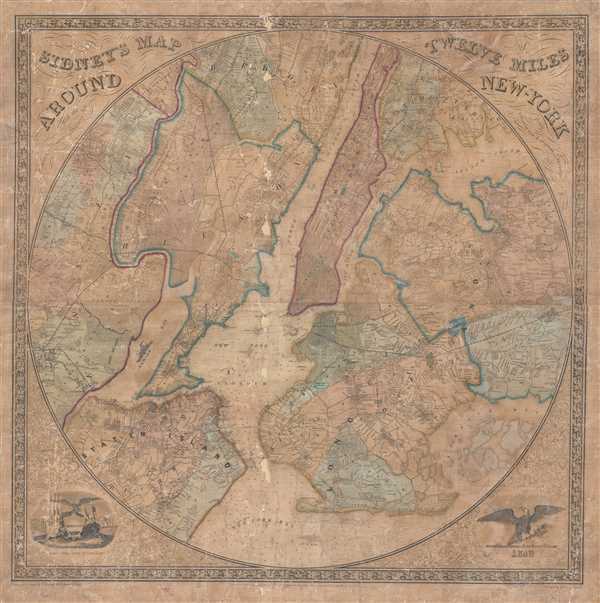 The map depicts the region from New Jersey to Westchester, Flushing, and Jamaica, and from Bergen, New Jersey and Inwood in Manhattan to Staten Island and New York Bay. Highly detailed, Manhattan's grid is illustrated up to what is probably Forty-Second Street, while the rest of the island is populated by farms and other private residences. Per the map, New York City consisted only of these gridded streets, the rest of Manhattan is referred to as New York County. As this map predates consolidation into the Greater City of New York by nearly fifty years, Long Island is broken into several different communities, including Brooklyn, Gravesend, Flatlands, New Utrecht, Flatbush, Bushwick, and Williamsburgh, along with Queens, Flushing, and Jamaica. Myriad private residences, from Orange, New Jersey to Flushing and Jamaica, are labeled by the names of their owners, although these residences usually fall outside of urban areas, like New York City, Newark, Brooklyn, and Williamburg. Several well known areas of New York City are labeled, including the Battery, Washington Square, Union Square, the Brooklyn Navy Yard, and Greenwood Cemetery. This map was produced by James Charles Sidney in 1849. James Charles Sidney (1819 - April 27, 1881) was an English engineer, architect, surveyor, and landscape architect. Born in England, Sidney first appears as a cartographer in the employ of John Jay Smith in Philadelphia during the early 1840s. He also worked for Smith’s son, Robert Pearsall Smith, who was one of the most prolific American map publishers of the mid-nineteenth century. Pearsall Smith published Sidney’s Map of Ten Miles Around — Map of the Circuit of Ten Miles around the City of Philadelphia in 1847 and his Map of the Township of Germantown with the Names of the Property Holders around 1848. By 1849, Sidney listed himself as a civil engineer in the Philadelphia city directory, having completed his earliest known architectural works in the mid-1840s. In 1850 or 1851, Sidney formed a partnership with James P. W. Neff, ‘engineers and architects’. This partnership appears to have lasted until 1854 or 1855, when Sidney moved to New York City to work with Robert Pearsall Smith’s firm, which was mapping New York State. By 1857 or 1858 Sidney had returned to Philadelphia and began a new partnership with Andrew Adams, which only lasted until 1859 or 1860. This partnership produced the master plan for Fairmount Park, adopted in 1859, and continued by Sidney with his new partner Frederick C. Merry. The Sidney and Merry partnership lasted until 1864 or 1865, when Sidney began working independently and spent the rest of his careers designing schools for the Controllers of the Public Schools of Philadelphia. Average. Map is professionally restored and backed on fresh linen however exhibits brittleness and slight loss. New York Public Library, Map Division, Map Div. 00-451.